Why: Your marketing stack, or Universal Analytics, is already connected to Google Tag Manager. Use this connection to share first party data out to the stack for your known and anonymous users, whether it was collected by BlueConic or integrated through another BlueConic connection. For the connection to work, you must have set up the Google Tag Manager tag on your pages. If you're using Google Tag Manager to serve Universal Analytics tags, check the steps for connecting BlueConic and UA through GTM. A pop-up window appears. Check the Show all box. Enter “GTM” in the Search bar. Click Google Tag Manager connection. The Google Tag Manager connection page opens. Optional: Restrict the connection to be active only on specific channels or URLs. Set up the connection by confirming the name of the Data layer that Google Tag Manager is using. The standard name is dataLayer. To make the connection work, you have to add at least one goal and switch the connection on. To import data into BlueConic add an import goal and follow the steps laid out in the goal. 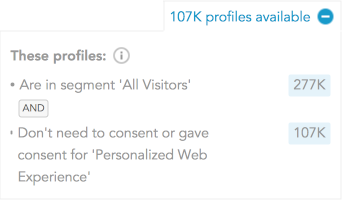 Select the BlueConic segment that holds the profiles that may be enriched with Google Tag Manager data. In the top right-hand corner, the number of profiles available for the import appears. This number shows how many profiles meet the conditions for the selected segment (for example, they have an email address and gave required consent for an objective) and therefore are available for the import. BlueConic tries to import only the profiles that have changed since the last import. The number of profiles imported might be lower than the number displayed here. Click Add mappings via visual picker or the link Add mapping (without visual picker) to add a mapping. Map the Google Tag Manager data to BlueConic profile properties. Enter the name of the Google Tag Manager field, or enter a Jsonpath expression (that starts with $.) to select the data. Select the BlueConic profile property the data populates by entering a search term. To export data into Google Tag Manager add an export goal and follow the steps laid out in the goal. Select the BlueConic segment that holds the visitors that will be exported to Google Tag Manager when they visit one of the channels selected under Setup. This number shows how many profiles meet the conditions for the selected segment (for example, they have an email address and gave required consent for an objective) and therefore are available for the export. BlueConic tries to export only the profiles that have changed since the last export. This number of profiles exported might be lower than the number displayed here. Map the BlueConic data that you want to export into Google Tag Manager. Select BlueConic profile property by entering a search term and enter the data field value it should populate. Click Add mapping to add a mapping rule for a property, or click Add multiple mappings to add rules for a number of properties. Set up the data configuration for the export format (as a single text string or as an array). Choose a value separator between individual values for single text export strings. Select the Push frequency you prefer. Optional: Select a BlueConic event that should also trigger this goal - in addition to the push frequency above. The BlueConic data will be pushed as events, and Google Tag Manager can identify these events by name. Enter the Event name BlueConic should use. Check the box for Push interaction viewed as separate events to Google Tag Manager if you want to send interaction view events separate from the push frequency defined in step 3. For example, if a lightbox pops up, it will immediately send an event. Check the box for Push BlueConic events as separate events to Google Tag Manager if you want BlueConic events to also be passed to Google Tag Manager as soon as they fire. Note that you can use the Add goal button create multiple export goals for this connection. There is an arrow going from Google Tag Manager to BlueConic, signifying that data is being imported. At the same time, the arrow going the other way shows data is also being exported from BlueConic to Google Tag Manager. Also, the arrows are green, which shows the connection is ready to be used. Connections can be added to Objectives, allowing for privacy management of the information that is being picked up. The connection will only work if the visitor consented to at least one of the objectives that it is linked to.